Saddle up your way to big wins with the Mustang Gold Slot which is 3x5 video slot with 25 fixed pay lines. Based on an American ranch style theme this online slot machine will certainly will entertain you for hours on end. To provide an enjoyable game play, the Mustang Gold Slot comes with traditional symbols and multiple bonus features that ensure to boost the winning opportunities for a player up to 12000 times the stake. Furthermore, the four fixed jackpots of this slot machine are triggered by matching horseshoe symbols, which not just enhance your experience further but also aim to provide an interactive gaming adventure. Playable on all devices, the players can bet between 0.25 to 125 credits per each spin for this slot machine. 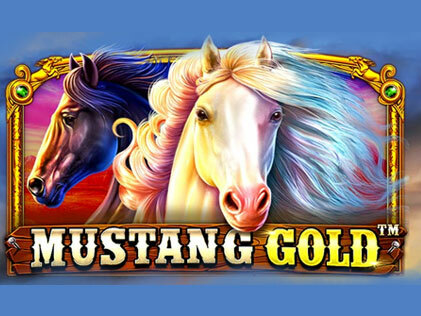 To decide whether you want to gallop into town on the Mustang Gold Slot for real money, read our unbiased review and also give this online slot a try for free via our demo play version right here! The symbols pay starting from the leftmost reel to the rightmost reel. Any Bonus Wins or Free Spins are automatically added to the regular payline win. All the values are expressed as coin wins. When multiple wins occur via different bet lines, all the wins are added to calculate the total win. Menu Button – This field is represented by the 'hamburger button' or simply put, three horizontal lines. This button toggles the game functions and settings. It consists of options like Quick Spin, Battery Saver mode, Sound, Introduction Screen. Players have a choice to either turn on or turn off these features by using this button. Information – Upon clicking the 'i' option, you get an access to the game rules, the various features, pay table and pay lines. This button allows the player to get a brief description on each of the features mentioned above. Spin Button – Clicking on this button enables the reels to spin on a predetermined bet level and coin value. Alternatively, you can use the space bar to spin the reels into action. Autoplay Option – If you get tired of spinning the reels manually, you can switch to Auto play where the players can just sit back and watch the action happen. Under this option, you can play a fixed number of spins without any interruption. The reels spin consecutively on the preset bet level. Select the various options according to your preference as given under this heading. Bet Button – This button determines the bet level you choose to spin your reels at. The denominations can be adjusted using +/- buttons with 0.25 to 125 bet credits. To open the bet menu, you can either click on the Bet Button or simply use the +/- buttons . Credits – This section depicts the total balance you have left to play the game. All the wins are added to the Credits and can be viewed on the bottom left side of the slot game page. Set amidst a typical American West plateau or ranch with warm colours in the backdrop. The opening window of the game reveals two Mustang horses with flying mane that will launch your ride to victory. The reels feature a Cowboy and a Cowgirl, acting as a testament to the stunning graphics and animations that this slot machine exhibits. The game play is interspersed with the neighing of the horses and a soothing country soundtrack which amplifies each time a winning combination is achieved. Hence, just like other Pragmatic Play games, this online slot too has managed to do full justice to the graphics, animations and sound effects. Standard Reel Symbols – The High Paying Symbols include a white Mustang Horse which proves to be the most rewarding symbol and is closely followed by the Black Mustang Horse. The Medium Value Symbols are represented by a Cowboy and a Cowgirl. Finally, the Low Paying Symbols are denoted by alphabets – A, K, Q and J. Wild Symbol – A wooden board with 'Mustang Gold' written atop constitutes the Wild Symbol. This symbol appears on reels 2, 3, 4 and 5 where it substitutes all symbols except the Scatter Symbol, Money Symbol and the Collect Symbol. Scatter Symbol – The scatter symbol is denoted by a camp fire which can land anywhere except for reel 1 and reel 5. A combination of not less than 3 Scatter symbols pays 1 times the total bet along with triggering the Free Spins Bonus round. Bonus Symbols – This online slot game has multiple bonus rounds that are triggered due to similar symbols landing on the pay lines. The Money Symbol is represented by a golden horseshoe whereas a golden sheriff badge with the word COLLECT written in green serves as the Collect symbol. This symbol only appears on reel 5. This symbol can be triggered in both, the base game as well as the free spins game. To activate this feature, two symbols are required in combination exactly like the name suggests. Under this feature, the Money collect symbol comes attached with random money values and can land anywhere on reels numbered from 1 to 4. However to trigger the Money Collect Feature, you must also hit the Collect symbol during the same spin. The Collect symbols lands only on reel 5. When the feature is activated, the value of all the Horseshoe symbols that appear on the screen are added together and the total sum is paid out. Since the old times, horse shoes have been considered lucky. However, the Mustang Gold Slot has not only associated horse shoes to bring good luck but also big wins. The Jackpot Reveal game is launched when a horseshoe symbol carries a Jackpot value instead of a cash prize. 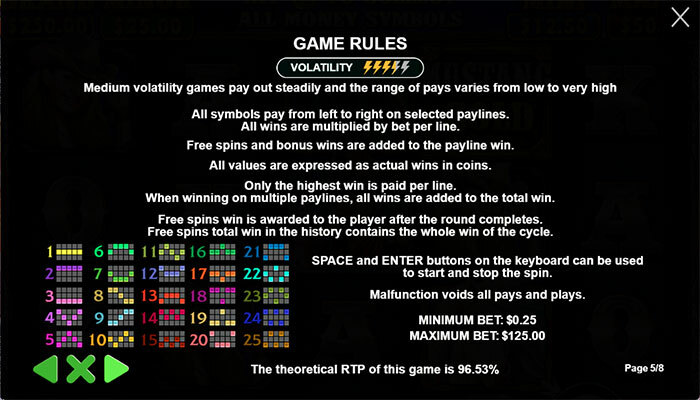 In this case, if the collect symbols falls on the fifth reel during the same spin then the Jackpot Game is triggered and guarantees a jackpot win out of the four fixed jackpots available. Once the Jackpot feature is activated, the standard paying symbols on the reels will be replaced by a screen full of Horseshoe symbols. To win the jackpot, you must pick and match the same symbol 3 times. Doing so, will enable you to take home the Mini, Minor, Major, or Grand Jackpots. The payouts for each is 50, 100, 200 and 1000 times your total stake respectively. In addition, each symbol will award one bonus round which shall be played successively. The Free Spins feature is activated when 3 or more Campfire Scatter symbols land anywhere on the reels 2, 3 and 4. The players are awarded with 8 free spins. What's more every additional 3 Scatter symbols will award another 8 Free Spins unlimited times! Also, the round further provides more chances to trigger the jackpots as the Horseshoe symbol and the Collector symbol appear rather frequently during this round, thus ensuring better winning possibilities. The Mustang Gold Slot is powered by Pragmatic Play, a leading software provider that serves players in 26 distinct languages. By providing engaging and entertaining content, this software provider strives to always stay at the forefront in the International iGaming industry. Founded just recently in the year 2015, Pragmatic Play has quickly gained immense popularity as a developer which creates slots and online games based on a mobile first mindset. Furthermore, with the Mustang Gold online slot, Pragmatic Play further aims to enhance the user experience by employing high quality graphics and providing lucrative bonus features. Pragmatic Play has indeed done a splendid job to bring the American West theme to life with beautiful graphics and awards wins that can go as high as 12000 times your stake. The Mustang Gold slot is a medium volatility slot game and pays a mighty theoretical return of 96.53% irrespective of the bet levels. The Mustang Gold Slot is based on the HTML5 technology which enables the slot game to run seamlessly on a host of cross platform devices. By and large, an impeccable addition to the already long list of great games by Pragmatic Play, this online slot features two very rewarding bonus rounds that offer a high winning potential and fun galore! Should you decide to play for real money, a list of online casinos who have included the Mustang Gold Slot game in their gaming library has been provided below. 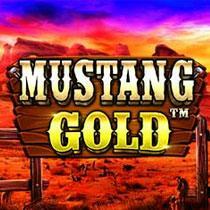 Please enter your review for the Mustang Gold Slot.